As a contrast to the other books here that relate to silent cinema, Wendy Marshall’s in-depth biography William Beaudine -- From Silents To Television is both fascinating and informative, a book that can be read by anyone remotely interested in film to those constantly working in the industry itself. Although Marshall herself is Beaudine’s grand daughter, this becomes not a hindrance but an advantage, for she is able to draw on material possibly unavailable to other researchers as well as her personal anecdotes of ‘Beau’himself, to provide a refreshingly good humoured biography of the man himself. It is pertinent that books such as Marshall’s prevent us from forgetting those figures in film history whom, whilst not the high-profile stars or directors (the ‘household names’), were nevertheless vital in the production of motion pictures which caused audiences to flock in their millions to the cinema in the pre-television era. William Beaudine is such a person-- not instantly recognisable to the average film-goer in today’s multiplex society, but responsible for a huge body of work which deserves both to be recognised and to be appreciated. The scope of this work (detailed in the well-presented and thorough filmography) causes one to remember that Beaudine was the man who directed four of the Will Hay films (including the classic Boys Will Be Boys in 1935). Less well-known is the fact that Beaudine started his acting career as early as 1909 (in To Save Her Soul, directed by none other than D.W. Griffith) and went on to direct Mary Pickford in Sparrows (1926) and work with the East Side Kids in a series of ‘B’movies before finishing his career working in television on episodes of Lassie and making Campbell’s Soup commercials. It is the sheer diversity of Beaudine’s work that Marshall manages to both capture and animate -- he did, after all, have a career that spanned the major changes in film history, even if he did not personally direct the landmark, genre-defining films within it. Considering the vastness of the Beaudine canon, Marshall does an excellent job in pulling all its facets together. In a concise fashion, yet with an continually evocative tone, the events leading to Beaudine’s first job at Biograph Studios are chronicled with a vivid sense of both period and personality. Of particular interest in the ‘Griffith era’, as in later relationships with other notable film industry personnel, are the comments made by Beaudine himself (who fortunately lived until 1970-- long enough to be interviewed about the ‘golden age’of Hollywood) about his compatriots. As well as providing a solid foundation for Marshall’s story, these comments shed further light on other people such as Griffith himself, and his working methods. Worthy of mention are the anecdotes of working under Griffith which provide a dose of humour and add interest to what could easily have become a rather dry chronology of events. Beaudine’s early story is truly a ‘rags to riches’one, and this emerges particularly strongly in the part of Marshall’s book where Beaudine’s personality helped him rise through the studio ranks to gain more prominence and ultimately direct films rather than assist in their making. Another notable feature of Beaudine’s directorial career is that, unlike someone such as Alfred Hitchcock (who was born in England yet lured to Hollywood), ‘Beau’moved to England from the ‘Golden Age’of 1930s Hollywood. However, the problems associated with Beaudine’s reluctance to pay income-tax caused him to move back to America late in 1937, where another shock awaited him-- Darryl Zanuck’s refusal to let him work for 20th Century Fox. In a fickle film industry, ‘Hollywood no longer claimed him [Beaudine] as one of its own’’(201) which provides a sense of tragic fate that is further brought home by the continually frank depiction of Beaudine as a hard-working, respected taskmaster. It is the very representation of William Beaudine throughout her book that makes Marshall’s revelation of his downturn in fortune so additionally compelling and melancholic. By 1953, having worked with many major stars, Beaudine found himself in California shooting Westerns for television. Although the work continued, times had changed, and William Beaudine was growing older. Fortunately, he did live to see the critical re-evaluation of The Canadian (1926) and the respect it created for him amongst film historians. Until his death aged seventy-eight, Beaudine was the oldest active director in the film world. Whether working on films for Biograph or Paramount, with major stars or ‘B’picture cast lists, he developed a knowledge and experience that was appreciated by those that worked with him, and it is this likeable nature that comes across movingly in Marshall’s biography. As well as providing a well-narrated analytical overview of William Beaudine’s life, Marshall’s book is notable for its humorous anecdotes, stories and incidents that make ‘Beau’stand out as an individual. The accompanying filmography and bibliography are excellent, and provide a wealth of resource material for those interested in more specific aspects of Beaudine’s career, including as they do newspapers, magazines and websites in addition to the films themselves. A detailed index supplements what is an extremely well-researched book, certain to be the ‘Bible’on Beaudine. The only criticism concerns the absence of notations as to the existence of his body of work, but this would inevitably involve a huge amount of research, a fair degree of assumption and speculation as well as a section of notes that would complicate the clearly structured information that is present. In her introduction, Wendy Marshall provides justification for her biography in these terms ‘‘William Beaudine’s legacy is worth remembering, and not just because he was important to me and my family’(xviii). This, I feel, is important. Iconography and the establishment of fan-based ‘cults’have decreed that posterity will remember those Hollywood players who, whatever their true merits, have cast a spell on audiences down the years. Less certain is the role in film history played by the ‘supporting cast’- the actors, actresses, technicians and directors who made the cinema their life as well as their livelihood. Books like William Beaudine -- From Silents To Television redress the balance and ensure that, whatever happens, some sort of documented legacy will survive so that academics to the casually interested observer will be made aware of these people. Despite all its glitz, glamour and worldwide popularity, a film industry consisting of a mere handful of iconic individuals would be very dull indeed, and we should be highly appreciative of the William Beaudine’s of this world for providing additional variety for that, after all, is the spice of cinematic life. 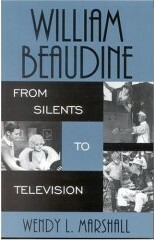 'William Beaudine - From Silents To Television' is published by the Scarecrow Press.